Kuberblog: ... on finding joy in small things. ... on finding joy in small things. There've been too many disasters in the world of late - I've been feeling the weight of the world. Flooding here in my home-town of Brisbane, the earthquake in New Zealand, the tsunami and nuclear emergency in Japan, all of them devastating. Sometimes I just can't look at the footage on the television any more. It amazes me that life goes on. Yesterday I read the most perfect quote which covers that quite nicely. "We've got to live, no matter how many skies have fallen." which is from DH Lawrence's Lady Chatterley's Lover. So, I've been trying to focus on the small, local things that bring me joy. 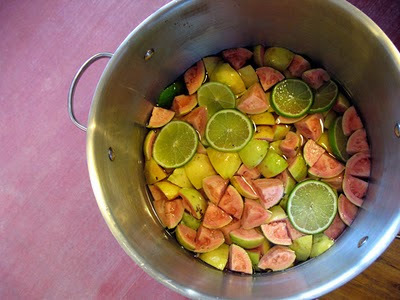 Like this: all the rain over this past summer has meant that there has just been a bumper crop of guavas. Guava trees often spring up in urban spots - I gathered kilos of them from a tree on my local railway cutting and made my first batch of guava jelly. And like this: I bought my very first pair of proper hiking boots in anticipation of climbing a mountain. As soon as they arrived I put them on with my new proper hiking socks and just fell in love. When I walk in them I feel tall and strong, like I'm standing up straighter. 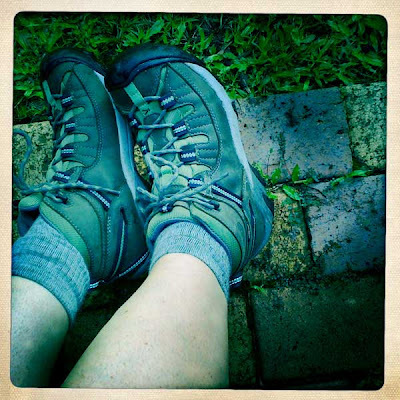 I've done all my previous hiking in Blundstone boots, but no more. No more! 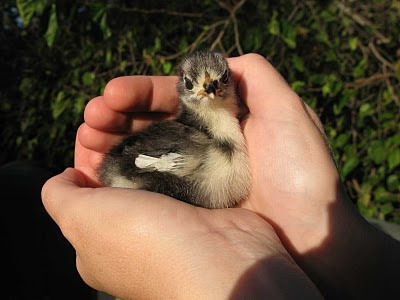 And most definitely like this: by hatching eggs. I have Pekin bantam chickens, and last year I ordered some fertile eggs from a breeder and put them under two broody hens. Of the 12 eggs, 8 hatched, and of them 5 were roosters! So, SO handsome - I wished I could have kept them all, but so far I've found lovely homes for 4 of them, and the last boy remains with me - at least - until the neighbours complain. He's only just starting to crow. Anyway, his biggest brother was much more advanced and was happily performing his roosterly duty with my older hen, Birkenstock. After he went to his new home my Ma took a couple of her eggs and put them under yet another broody. "Those eggs won't be fertile," I said. "He's too young." My Ma replied "Let's put them under Sylvia and find out!" Last weekend - look what happened! So, how do you beat the weight of the world?